Chances are you have at least one party to go to or to host and you may be looking for something extra special to bring. Or maybe you are just in the holiday spirit in your own home and seeing Egg Nog on the shelves makes you giddy like a kid. No shame in that either. 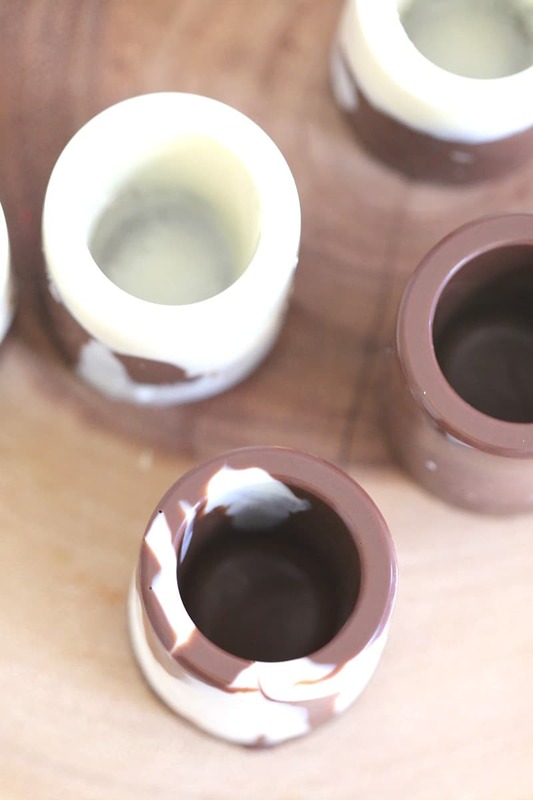 This season I wanted to share a totally fun, honestly easy, and YUMMY DIY for making your own chocolate shot glasses. 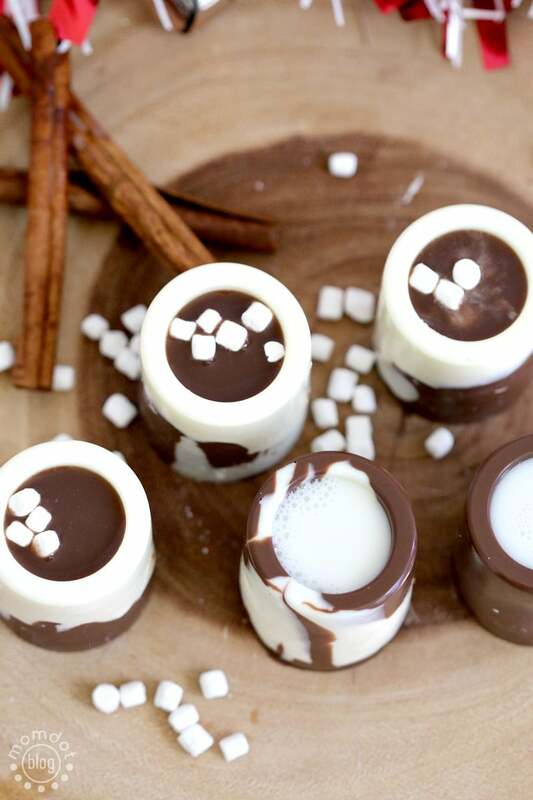 To make your own chocolate shot glasses for serving you need just a few important things. First, you need tasty drinks to serve up. 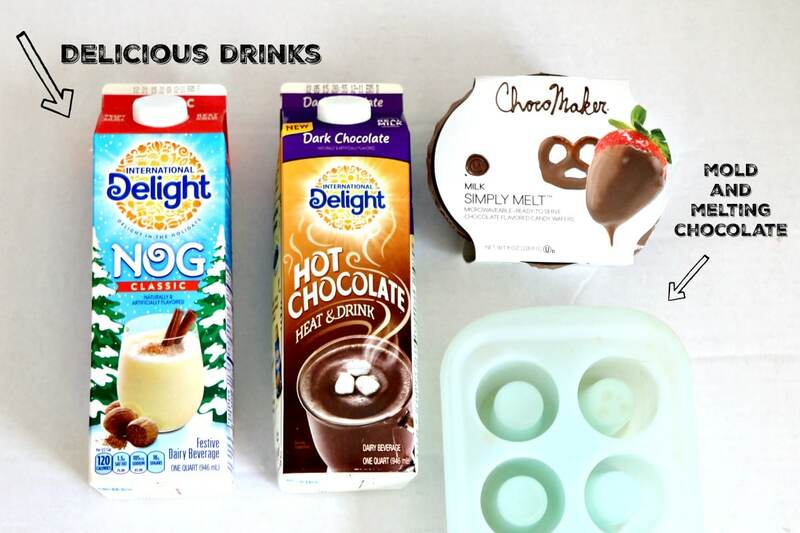 Because chocolate melts in the heat, you do need a cold drink and new products like International Delight’s NOG is a fantastic fit. You can also pick up the International Delight Hot Chocolate and just skip the heating part. Second, you need some ChocoMaker melting chocolate. I have tested many types of melting chocolate and this one, that comes in tiny tubs, works the best. It heats up quickly and its an incredibly smooth and rich chocolate that leaves very little air in the molds. Trust me when I say I made a lot of bad shot glasses to figure out the best brand to share. 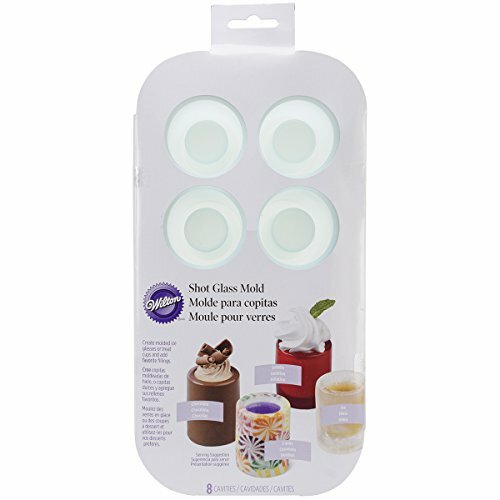 Last but not least, you need shot glass molds. 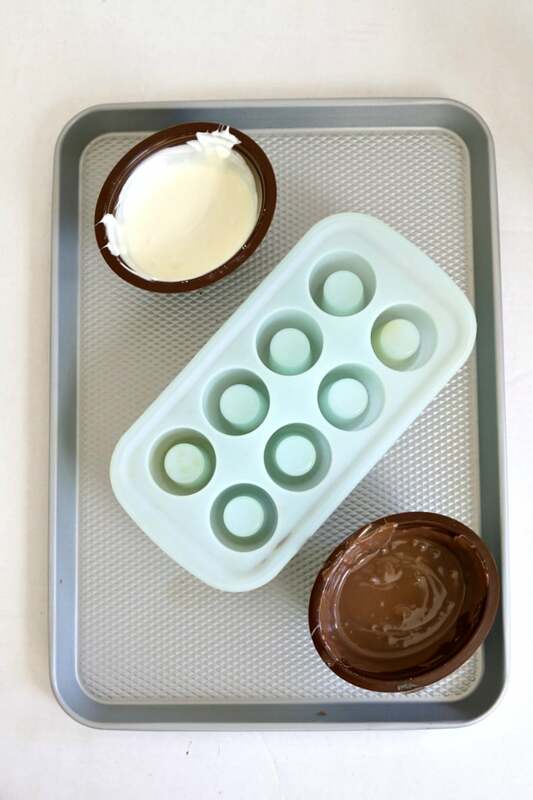 These molds are super easy to use and you can melt IN the mold if you want. 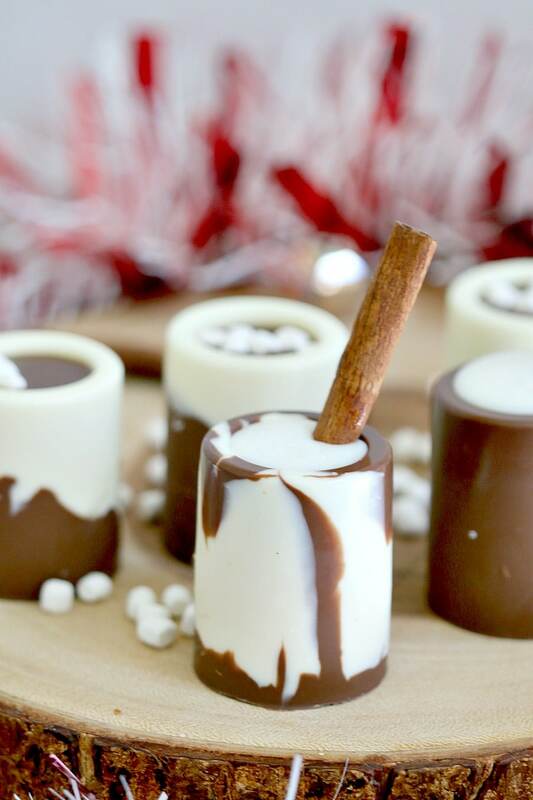 I have personally tested all sorts of candy shot glasses as well and while I don’t have a perfect tutorial to share yet on that, I can say these are pretty fun to have on hand for all your holidays. Make sure you pick up a set- they also work with candies like jolly ranchers and peppermint! First, heat and melt your chocolate according to instructions. Burned chocolate is pretty much horrible, so do exactly what they say for the best results. Once your chocolate is ready, pour slowly into the molds . Feel free to make them solid OR mix up colors for a swirly effect. To get all the air out of your shot glasses and avoid bubbles when they are done, once poured to the brim, you can gently lift the mold and put down on the counter a few times to pop out the air. You should see air surfacing and popping. If you don’t do this you will have some indentations in the side of your glasses. It won’t affect the taste, but some prefer a smoother look. You can pop in the fridge for about 10 minutes to set the chocolate. Once you tap the mold and the chocolate is solid, you simply pop out of the molds. If the chocolate is set, it should remove easily. Push the glass out and then twist the middle portion off. 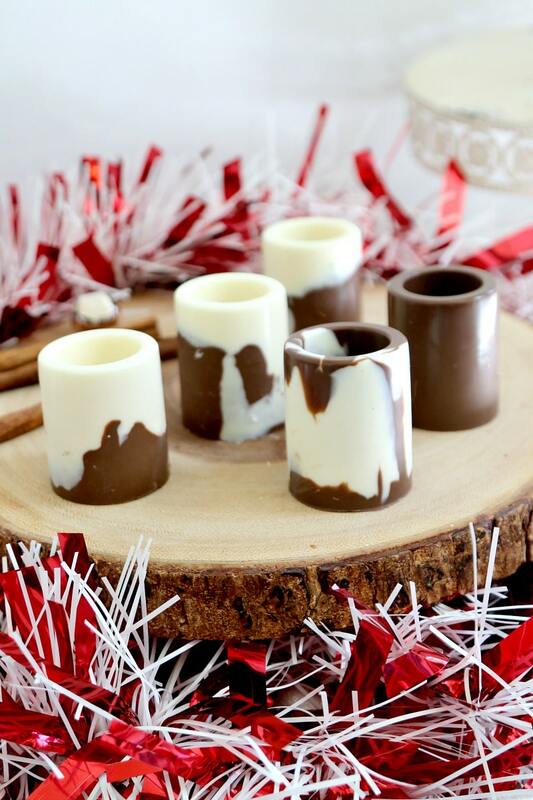 Fill up your chocolate shot glasses with tasty cold beverages like International Delights Nog and International Delights Hot Chocolate- just dont heat it up or you will melt your chocolate shot glass! Feel free to garnish with marshmallows, cinnamon sticks, or chocolate shavings.